Louis H. Fead was born on May 2, 1877, the eighth of nine children of John Lawrence and Augusta (Walther) Fead. The family lived in Lexington, Michigan, where they operated a small wool mill. Louis was educated in the local public schools, was graduated as valedictorian at age 16, and attended Olivet College, eventually earning a Doctor of Laws. 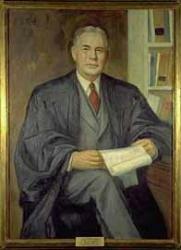 In 1897 he moved to Detroit and worked in the law offices of Bacon & Palmer and attended the Detroit College of Law. In 1898, he enrolled in the University of Michigan Law School where he received a Bachelor of Laws in 1900. A lover of outdoor sports and wilderness, Fead moved to Newberry in the Upper Peninsula soon after graduating from the University of Michigan. He opened a modest practice, but had not worked independently for more than a few months before being elected Prosecuting Attorney for Luce County. He held this office from 1901 to 1913 and learned the responsibilities of the profession and the obligations of public office. Immediately following his terms as Prosecuting Attorney, Fead was elected to the Circuit Court of the eleventh district, an office he held through repeated re-elections until 1928. In June 1929, after Fead had presided over the trial of “King Ben” of the Israelite House of David on public nuisance charges, the Michigan Supreme Court, on hearing the appeal in the case, commended him for his handling of a lengthy and complicated trial involving “…51 days of actual trial, 225 witnesses, 500 exhibits, 73 depositions, and 15,000 pages of testimony.” And so Fead continued to distinguish himself on the Circuit Court until February 21, 1928, when Governor Fred W. Green appointed him to the Michigan Supreme Court to fill the remainder of Chief Justice Richard C. Flannigan’s term. Under the rules of the Court the appointee immediately became Chief Justice. He presided from 1928 until 1937, when Fead was defeated in his bid for re-election.